The number of single-family homes and condos that traded hands across the greater Bay Area totaled 7,659 in August, down 9.9 percent on a year-over-year basis and another 7-year seasonal low, according to recorded sales data from CoreLogic. 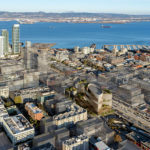 In San Francisco, recorded sales totaled 466 in August, down 4.3 percent from July at a time of the year when sales typically inch up and 5.9 percent lower on a year-over-year basis despite increasing levels of inventory. Across the bay, homes sales totaled 1,626 in Alameda County, down 12.6 percent on a year-over-year basis, sales in Contra Costa County totaled 1,538, down 12.6 percent, and sales in Solano County totaled 619, down 15.9 percent. Home sales in Santa Clara County (1,691) were down 9.3 percent on a year-over-year basis in August while sales in San Mateo (600) were 10.4 lower. Up north, home sales in Napa (150) were 8.7 percent higher on a year-over-year basis while sales in Sonoma (663) were 3.5 percent lower and sales in Marin (306) were up 4.1 percent. The median price paid for those aforementioned 466 homes in San Francisco was $1,310,000 in August, down 5.1 percent from a record $1,380,000 in May but still 7.2 percent above its mark at the same time last year. 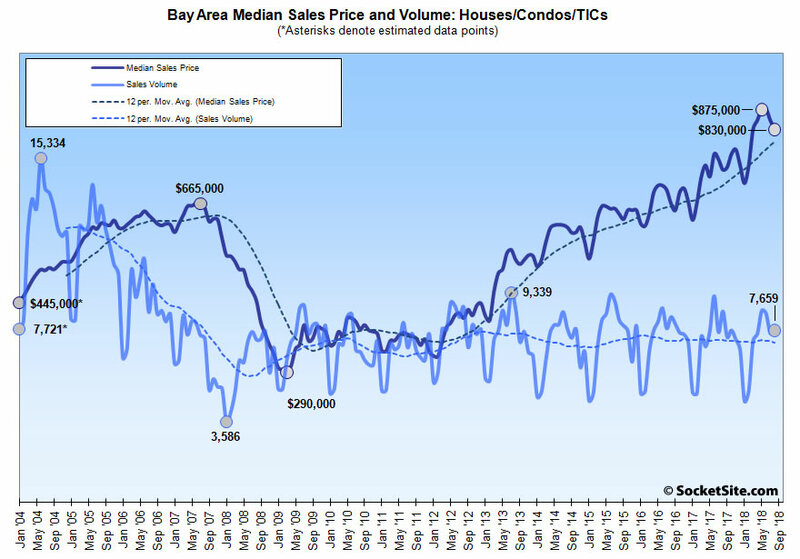 The median sale price in Alameda County slipped 0.5 percent to $850,000 but remains 11.9 percent higher on a year-over-year basis; the median sale price in Contra Costa County dropped 2.9 percent to $614,500 but is still running 7.2 percent higher, year-over-year; and the median sale price in Solano County slipped 0.5 percent to $430,000 but remains 8.0 percent higher versus the same time last year. The median sale price in Santa Clara County ticked up 1.1 percent in August to $1,120,000 and is now running 19.8 percent above its mark at the same time last year while the median sale price in San Mateo County slipped 4.4 percent to $1,300,000 but remains 13.0 percent higher, year-over-year. And up in Marin, the median sale price dropped 9.1 percent to $1,000,000 but remains 3.6 percent above its mark in August of 2017. The median in Napa slipped 1.4 percent to $660,000 but remains 10.7 percent above its mark at the same time last year, while the median price in Sonoma ticked up 1.3 percent to $607,000, which is 5.7 percent higher on a year-over-year basis. As such, the median home sale price across the greater Bay Area slipped 2.4 percent from July to $830,000 in August but remains 12.2 percent above its mark at the same time last year. This is now a decades long trend of decreasing transaction volume, despite (slightly) more units existing every year from construction and condo conversions. Look at 2005 to today – similar points in the cycle but way more transactions. People are choosing to hold their properties for longer for whatever reason than before. We had prices go up a ton recently and affordability is low but so did we in 2005 and people transacted then but not now. 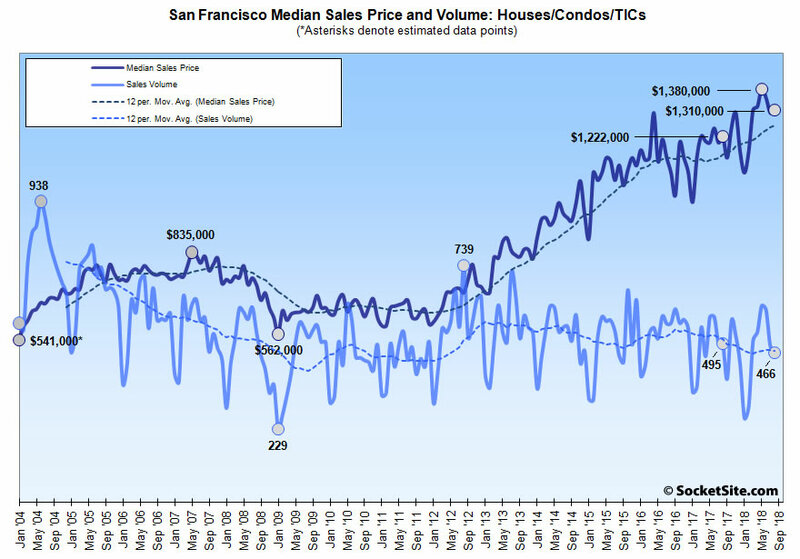 More accurately, sales volume in San Francisco peaked in 2004; started declining, along with the market, in 2005; bottomed in 2011; jumped in 2012; and then reversed course again around 2016. I would say most who would like to trade up can’t afford (or can’t stomach) the higher taxes that come with it, especially to see City Hall spend it frivolously. 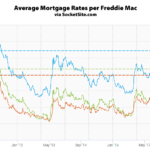 A SFH at 1.5M equates to an extra 2k/mth for taxes & insurance on top of the mortgage. Over 30 yrs just the taxes to the City would be >600k! Other than a complete change in City Hall, with a 50% immediate reduction in expenses, those higher taxes and fees will continue to escalate in a steep curve. I see more homeowners opting to stay put and renovate (budget permitting) what they have. Instead of trading up, many trade laterally by buying another place elsewhere and using that as a vacation spot. Sorry, which taxes and fees are escalating at a sharp rate? Property taxes are certainly not.